Other than its beautiful lake, one of the main things that Big Bear Lake is known for is its incredible mountains that offer fantastic ski opportunities. One of its ski resorts hosted the inaugural Winter X Games, and the other offers experiences you won’t find elsewhere in Southern California. Keep reading to find out more about Big Bear’s Ski Resorts. 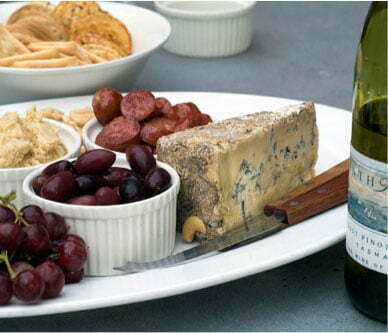 Looking for things to do in Big Bear after your day on the slopes? Download our free Vacation Guide for instant access to top recommendations for other great outdoor activities, best restaurants, shopping, and more! What are Big Bear’s Ski Resorts? 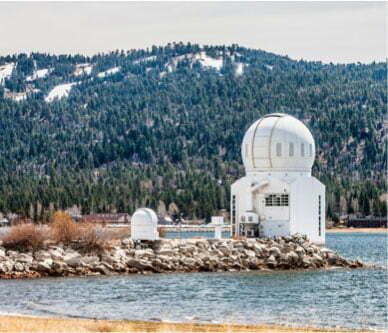 Big Bear Mountain Ski Resort in Big Bear Lake, CA, encompasses two ski resorts: Bear Mountain and Snow Summit. 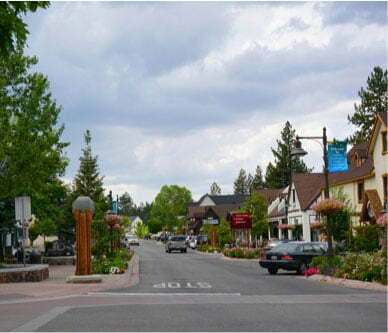 These twin resorts are one of the most popular destinations in Big Bear, no matter the time of year. However, winter is a particularly thrilling time to visit, and each ski resort offers a unique experience. Whether you are a seasoned skier or strapping on skis for the first time, Bear Mountain has something for you. It’s been around since 1943 when it was known as Moonridge Ski Area. You’ll find an even mix of difficulty here, with 30% of the terrain at first-time beginner to low intermediate difficulty, 40% at intermediate, and 30% at advanced. Beginners here can take advantage of the largest learning area in Southern California. Practice at the terrain-based learning area or hone your abilities at the Skillbuilder Parks. Bear Mountain also offers a variety of ski and snowboard lessons for kids and adults. A particularly unique feature of Bear Mountain is that it sponsors the United States Adaptive Recreation Center, which provides skiing and snowboarding to adaptive athletes of all ages. Once you’ve warmed up, you’ll have quite the range of adventures to choose from on the slopes. Bear Mountain enjoys over 500 acres of undeveloped or natural terrain and almost 200 acres of developed terrain. It’s also home to the only halfpipes and highest lift-served peak in Southern California, as the lift will take you to the top of Bear Mountain’s full elevation of 8,805 feet. Snow Summit boasts over 18 skiable miles across more than 240 acres of terrain and 31 trails spanning all ability levels. It enjoys the most consistent snow conditions in Southern California thanks to its snowmaking abilities and has the most operating days per season in Southern California. In addition to the skiing and snowboarding opportunities, Snow Summit is also home to plenty of other winter activities. Go tubing at the Grizzly Ridge Tube Park, scale the 30-foot climbing wall, or enjoy après activities by one of the fire pits in the meadow area. You’ll also find a fair mix of difficulty levels here, with 35% first-time beginner to low intermediate, 40% intermediate, and 25% advanced. If you’ve ever wanted to ride under the stars, you’ll get your chance at Snow Summit! The quintessential beginner and intermediate runs, as well as Westridge Park, will are open from 3 p.m. to 8 p.m. Westridge Park undergoes a full evening groom during the night sessions, affording riders with fresh terrain. Perhaps the most obvious thing you will need is equipment! Big Bear Mountain Resort has several rental options available from shops conveniently located at the base of the chairlift. Choose from a variety of package options, whether you need gear for skiing or snowboarding or accessories like a helmet or boots. Depending on the duration of your stay, you’ll need either lift tickets or a season pass. Big Bear Mountain Resort offers half-day, full-day, multi-day, and night session lift tickets. If it’s your birthday, you get a free lift ticket good until 4 p.m. that day! There are several passes available, too, ranging from access to Bear Mountain and Snow Summit to the extensive Ikon Pass. If you want to know what the conditions are like before you go, the resort has several live webcams throughout both Bear Mountain and Snow Summit. For Big Bear Mountain Resort’s weather and snow report, hours of operation, and trail maps, check out their website. After a day of fun in the snow, return to a cozy Big Bear Lakefront Cabin. Choose from lodgings close to the ski slopes or from ones that have expansive views of Big Bear Lake. Regardless of where you stay in Big Bear, our cabins will put you close to top attractions in this picturesque, bustling mountain city. Each of our cabins provides everything you’ll need to make your vacation relaxing. 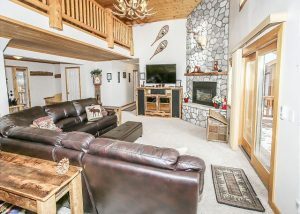 Our Snowmass Haven is perfect for you and your family or your large group of friends. The living room and kitchen’s open floor plan, vaulted ceilings, and abundance of windows emphasize the spacious interior. This cabin remains cozy while still being roomy, with plenty of comfortable log furniture and warm beds. Warm up with a cup of hot cocoa in front of the crackling fireplace or by soaking in the steaming hot tub outside on the large deck. A game room in the loft ensures that everyone will stay entertained while here. 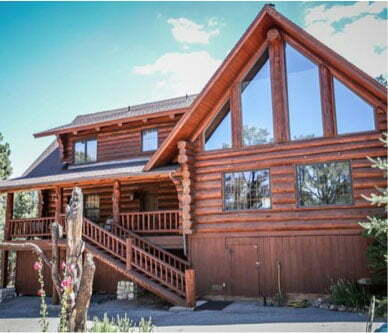 Be sure to browse all our luxury cabins before booking your vacation in Big Bear!